'Tis the season...for sinus problems. And this product is bound to work, if not as intended, then when your beverage shoots out your nose when looking at this ad. Thanks to Gallery fan, Marty Falatic, who found this advertisement in a Safeway coupon book. This post first made me laugh. Then I remembered that I own a similar device (though mine has added "jet propulsion" from squeezing the bottle). Then I realized that the reason I was having trouble sleeping the last couple nights was due to upper respiratory congestion. So I dug out my "sinus irrigation device" and went to town. The result: the best night's sleep I've had in a week. Thank you, Derek, for reminding me of the benefits of propelling a warm saline solution through my gunked up sinus cavities. 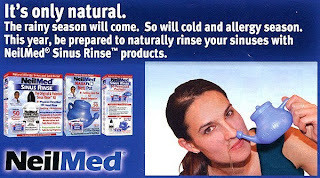 Hey, don't be hatin' on the Neti Pot. Those things work miracles. The ad is a little off-putting, though.